The Largest Resource Center On Armenian Genocide, Covering 3600+ Articles, 200+ Free E-Books, 500+ Research Papers, Historical Newspaper Screen Shots Dates Back to 1800's, 100+ Videos, Eyewitness Accounts . . The author of the following pages has been well known for the last ten years as one of the most active leaders of the Indian revolutionary party. * Born of a Kayasth family in Delhi in 1884, he was educated in . . . . .
St. Stephen's College, until he took the B.A. degree of the Punjab University and was awarded a scholar-ship tenable in the Government College, Lahore. In 1904 he stood first in the list of the successful candi-dates for the M.A. degree in English literature, and on the recommendation of the Punjab University was given a State scholarship of Â£200 a year by the Government of India. He entered St. John's College, Oxford, in 1905, and began to read for the Honours School of Modern History, but in 1907 resigned his Government scholarship and removed his name from the college books. He associated himself with Shyamji Krishnavarma, who was at that time the recognised leader of the Indian revolutionary move-ment, and in his journal. The Indian Sociologist (October, 1907), stated that HarDayalhad re ignedhis scholarship, "as he holds that no Indian who really loves his country ought to compromise his principles and barter his rectitude of conduct for any favour whatever at the hands of the alien oppressive rulers of India." 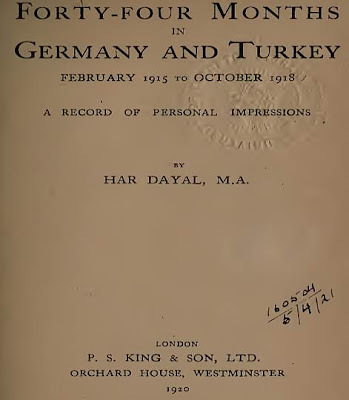 After a visit to India, where he spread the doctrine of active hostility to the British Government, Har Dayal in 1908 rejoined Shyamji Krishnavarma in Paris, but finding him unwilling to adopt violent methods in the furtherance of political ends, he deter-mined to transfer the centre of his activities to America, and in 191 1 settled in San Francisco. Here he published in several Indian languages a newspaper called Ghadr (" Mutiny "), in which he advocated murder and revolution, the formation of secret societies, and the adoption of every possible means of violence for the expulsion of the British from India. He also addressed meetings in various towns in America in support of the Indian revolutionary movement, until in March, 1914, he was arrested by the authorities of the United States Government, with a view to his deportation as an undesirable alien. Released on bail, he escaped to Switzerland, and after the war broke out, joined the Indian National Party, which worked in Berlin under the directions of the German Foreign Office. In the following pages he has described his experiences and the reasons that have led him to change his attitude towards British rule in India. 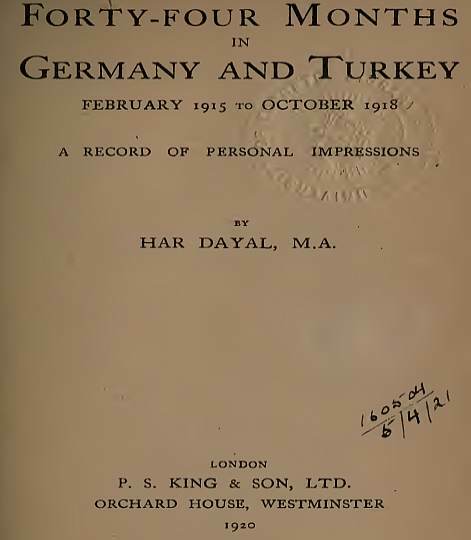 Forty-Four Months In Germany & Turkey, Feb 1915 To Oct 1918, Record Of Personal Impressions. You Wouldn't Be Allowed Such Freedom In Most Of The Other Sites At All. You understand that the site content express the author's views, not necessarily those of the site. You also agree that you will not post any material which is false, hateful, threatening, invasive of a person’s privacy, or in violation of any law. Please read the post then write a comment in English by referring to the specific points in the post and do preview your comment for proper grammar /spelling. 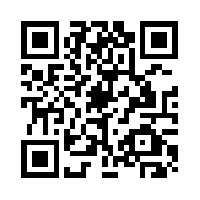 You need a Google Account (such as Gmail) to publish your comments. Then copy and paste the final/corrected version into the comment box here as Google/Blogger may not allow re-editing/correcting once entered in some cases. * Your Subscription Starts Only AFTER You Respond To "VERIFICATION EMAIL"
Join Our Facebook Group NOW !